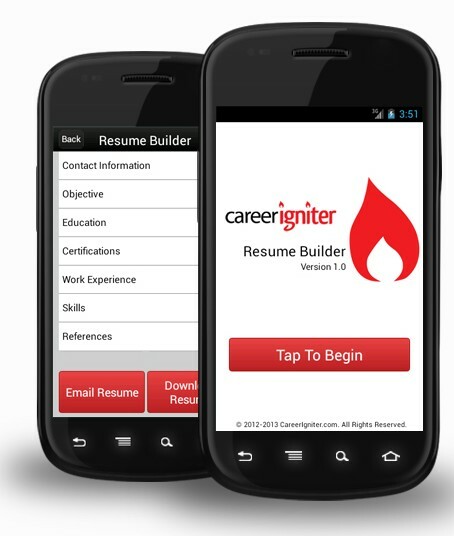 The Career Igniter Resume Builder for Android allows you to create a resume on your Android smartphone. Just complete areas such as your education, skills, work experience, education and let our free resume builder do the rest. Creating a resume has never been easier with the Career Igniter Resume Builder for Android! For those who are interested can download Igniter Career Resume Builder application for free, and use in making your resume. Nowadays technology gives us many facilities. Wiring a professional and beautiful looking resume by an application is a great invention. Thank you to introduce us with the application. Sometimes we are not satisfied with the application, so look at other sample resumes to get Inspritation, and share your own to get feedback. Wow that's therefore superb tips sir i actually love it plenty. Writing covering letter isn't a straightforward job however I appreciate you for such a beautiful job. I additionally wish to understand concerning custom essay writing that is somehow vital for the folks. This is the quite interesting article for all businessman. I will definitely install this app in my cellphone. Anyhow, I'm recently working on writing thesis.If any students wants to get amazing tips relevant to their subject then have a look here. Thanks for this article about resume writing, I really appreciate and this is very resume from Android phone. Also visit site to get graduate school sop writing services. This is very helpful for writers and I really like your writing style. Keep it up like. Anyone can make a resume but making a professional resume you have to think about it and take some help from this article for the resume. click to read and know your best to writing your papers. Finding the best resume composing administration that will really get you your cash's worth isn't as simple as the vast majority figure it may be. There are huge amounts of organizations and people out there that are always saying that they are "specialists" at composing resumes. Thank you for telling us How to create a Professional Resume from Android Phone. This is a great information for all the android user. You can visit here http://www.sopwriting.org/your-personal-statement-help/ for android phone tips. Excellent post, Finding the best resume composing administration that will really get you your http://www.writemywaiver.com/ as simple as the vast majority think it seems to be.